The New England Conservatory’s proposed story learning center on Huntington Avenue and Gainsborough Street would include 60 practice rooms and a public jazz cafe. New England Conservatory, a prestigious center of music performance and education in Boston, wants to make a bold statement with its first major expansion in five decades: a pair of modern glass buildings that would shake up a dated section of the Fenway. Newly released designs show a striking transformation of the mostly brick campus, adding transparent facades that would put daily music performances on full public display. 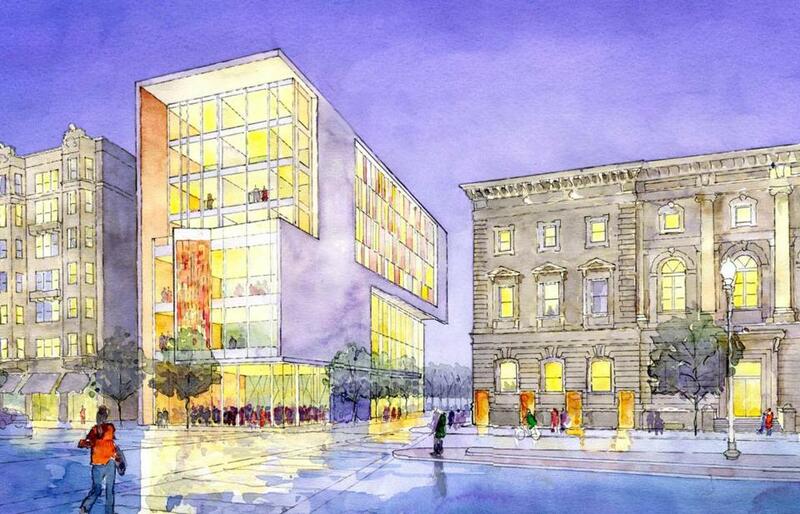 The centerpiece is an $85 million building on St. Botolph Street that would include student residences, a 200-seat black box theater, a new ­library and dining hall, and jazz and orchestral chambers that would be visible from the sidewalk. A classroom building would be built in a second phase of work. The conservatory does not expect to begin construction on the student building for several years because it is still raising funds for the project. But school administrators revealed preliminary designs this week to introduce the projects beyond the Fenway and to help build enthusiasm for the expansion, even producing a video that shows how the buildings would fit into the neighborhood. “We designed this project very much with the idea of adding lots of natural light and meeting spaces to encourage people to congregate, socialize, and share ideas,” said the conservatory’s president, Tony Woodcock. The expansion has won support from neighbors and city officials. The Boston Redevelopment Authority approved the outlines of the project last month, estimating that the two new buildings would cost about $130 million and add 200,000 square feet of space to the school’s campus. The design of each building needs to be approved before construction can begin. Some proposals, however, have proved controversial. A 17-story dorm planned at Northeastern University has generated concern that the building would overwhelm the nearby century-old YMCA and the conservatory’s Jordan Hall, opened in 1903. But the Northeastern project received approval from the BRA last month, putting it a step closer to construction. The conservatory itself has not built any buildings since 1959, leaving much of its campus feeling dated. In the mid-1990s, it completed a restoration of Jordan Hall, which boasts a signature 1,000-seat performance space that regularly features prominent musicians from around the world and serves as the school’s most important classroom. More recently, in a $20 million project, it refurbished the masonry on its four buildings, replaced windows to improve soundproofing and weather resistance, and installed energy-efficient roofs on two buildings. But Woodcock said the campus needs updated classrooms and living spaces to continue to draw top students. The 12-story student building, to replace a parking lot on St. Botolph Street, would add dozens of dormitory beds, allowing the conservatory to house both first- and second-year students on campus. The conservatory plans to pay for the building with a $70 million fund-raising campaign, financing the remaining $15 million. Administrators declined to say how much money has been raised to far. After finishing the student building, the conservatory would begin the seven-story classroom building at the corner of Gainsborough Street and Huntington Avenue. That building would replace a dorm and include 60 individual practice rooms, computer labs, a writing center, and a ground-floor jazz cafe that would be open to the public. The firms designing the expansion, Ann Beha Architects and Gensler, also sought to craft a more welcoming environment — for neighbors and music patrons — by dedicating certain spots for social activities and making performance spaces that passersby can see from the street. Plans also call for 30 new trees and other green space that would help break up the masonry and concrete that dominate the area. “It’s going to give NEC a new presence in the neighborhood,” said Thomas Hotaling, a principal with Ann Beha architects. He added that the firm was careful not to detract from the prominence of Jordan Hall, which Ann Beha helped restore in 1995.